If you’ve recently upgraded Wordtwit, you’ll notice some changes which are specifically to address the old Twitter API being deprecated. 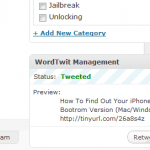 You will need to create a Twitter Application for Wordtwit to be able to add a Twitter account. Make sure that you set the callback URL to your websites URL, which is what I had skipped and caused the “Add Account” button under Twitter accounts to not function at all. Twitter App for Facebook is Broken! But Twitter Support is Non-Existant!